Evil. Thats the only way I can describe chemotherapy. My second cycle of the treatment was horrific. Not the day itself. That was fine, fun in the usual speeding time with special people chatting, drinking coffee and trying to ignore the drip that was feeding me the toxic cocktail of drugs. No, it was the days afterwards that were hard to handle. As the steroids wore off, the horrific-ness kicked in. It was one of the worst chemo hangovers that I can remember having. My mood felt as awful as the physical symptoms. The last time I felt that ill was last year when I was in intensive care following major surgery and a brief, unexpected, flirtation with dying. The only positive thing I can say is that there was none of the nausea of chemo no 1. I didn’t have any projective vomiting yay! Thanks to everyone who tweeted me suggestions about what anti-sickness medicine I should try. The new tablets are working beautifully. Then it lifted. 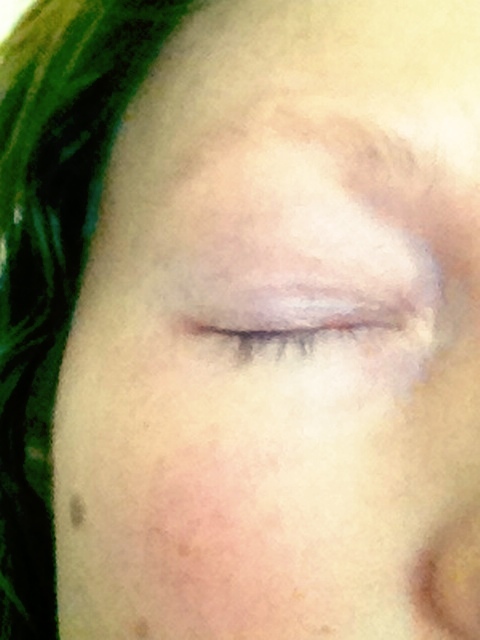 After almost a week, the nasty chemo symptoms just left me. I’m still tired but at least I feel human again. Luckily this happened just as I was due to do a day at work. Okay, it was down to more than just luck. I had thought that I’d be recovered by then. You may be wondering why I still want to do my job. It’s totally my choice to work. I don’t want the cancer, the chemo and the uggggggh feelings to be the only things in my life. Besides, I really enjoy it. 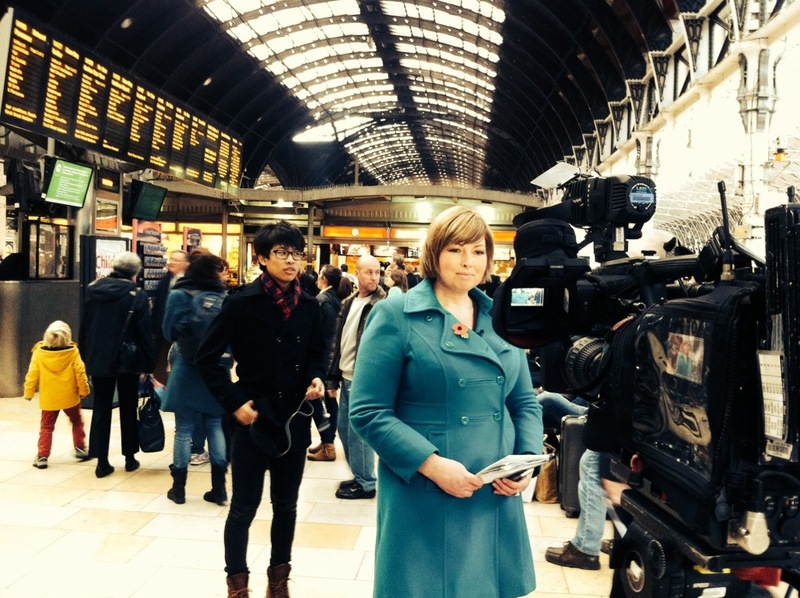 On Monday I was reporting on the impact of the storms for BBC News. It wasn’t feeling ill again that I was worried about but more the windy weather. This was my first day wearing a wig again. Not such perfect timing. When I was stood outside I had the straps inside the wig on their tightest setting. It was a vice like grip and it hurt a bit but at least it kept my wig secure on my head. There would be no chance that a cheeky gust of wind would give it lift off! It’s the same wig as I wore on TV before, only my hairdresser Angela has given it a new look. I do have a whole new autumn/winter collection of wigs to wear but I want to start off with something I’m comfortable with. My hair seriously started to fall out just as I was feeling so desperately ill. Great big handfuls of my lovely, new hair. I almost had a proper fringe. It seemed that most of it slid off at night and onto my pillow. Previously my hair has slowly left me so the speed at which I went bald this time was a shock. It took about a week before all I had was some lonely tufts. It looked as horrific as I felt. This is one of the hardest parts of the treatment. You understand that you are going to be very ill but it the fact you lose your hair as well is very upsetting. You no longer look like yourself. The chemo takes away your identity. I knew there was something unpleasant I had to do. A few days ago I had what remained of my hair shaved off. There is nothing left. My appearance has gone from poorly to pop star. Now I look like Jessie J when she shaved her head. Ha! I’m only joking. My head looks all white and weird however it is better than it was. Most importantly, instead of letting the chemo do something to me, I took charge. And this makes me feel strong again. As I don’t have a proper wig yet, Barbarella is on stand-by. 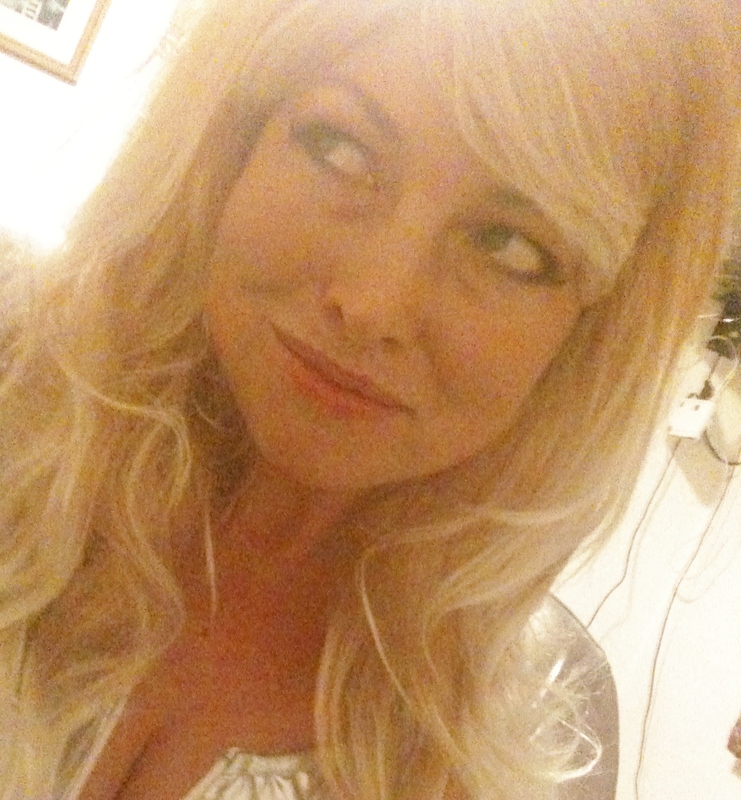 Barbarella is a massive long blond wig that I wore to a friend’s fancy dress party last year. I could never have imagined that just over six months later I might have to wear it for real. The fake hair came with a 60’s style zip-up dress. The outfit was supposed to transform me into Barbarella as in the science fiction flick. Incredibly though I still have hair. I thought I’d be bald by now. The chemo should have seen to that a couple of weeks ago. Instead as I write this I have almost a full head of really greasy hair. I’m still following the advice of the hospital’s wig man. To try not to wash it very often, to preserve what’s still there. I can’t even put it up or do anything that would encourage it to fall out. That includes using dry shampoo. Please don’t tell me that after a while it starts to clean itself. If I was backpacking around Thailand then I wouldn’t mind trying out that theory. 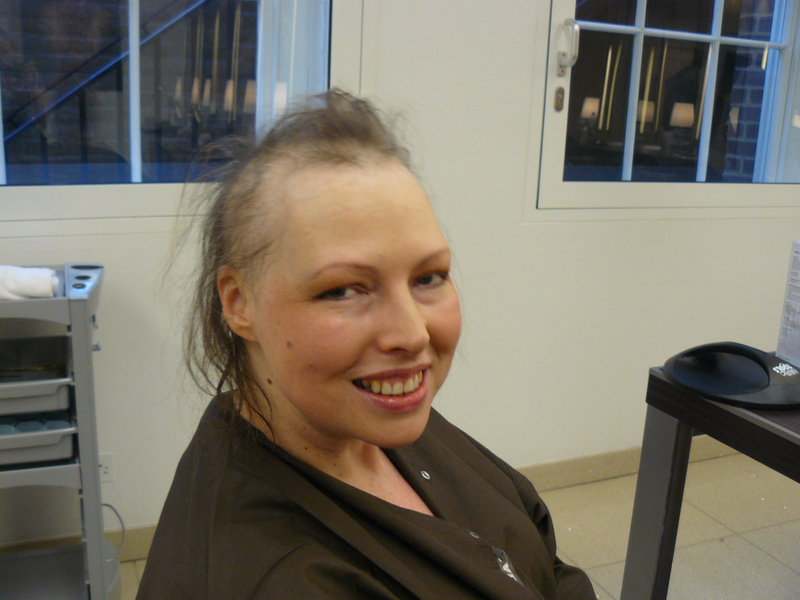 Going through treatment for cancer with skanky hair is a whole different matter. I can safely say that after more than a week, my hair does not self-clean. It just continues to fall out in great big handfuls especially on the rare occasions that it is washed. My hair is thinning but I must have so much of the stuff normally that you can’t really tell. Well apart from a bald patch that I can cleverly disguise with a comb-over. I reckon that it’s just a matter of time before I have more bald patch than comb-over. When that happens I’ll get it all shaved off. I have to say I’m feeling a lot more relaxed now as I wait for that moment. I won’t get my NHS wig for at least another week and I don’t want to buy any wigs until all my hair is gone. So if I do have to become Barbarella anytime soon then I’ll be happy to be blond but I certainly won’t be wearing that silver dress again! Well it’s still here. Mostly. My hair is now falling out ever so slightly. It’s hard to work out if this is normal and or down to the evil chemo drugs. I know it’s really the later but I’m trying to pretend otherwise. Just because I lost it all once before it doesn’t make the prospect of this happening all over again any easier. 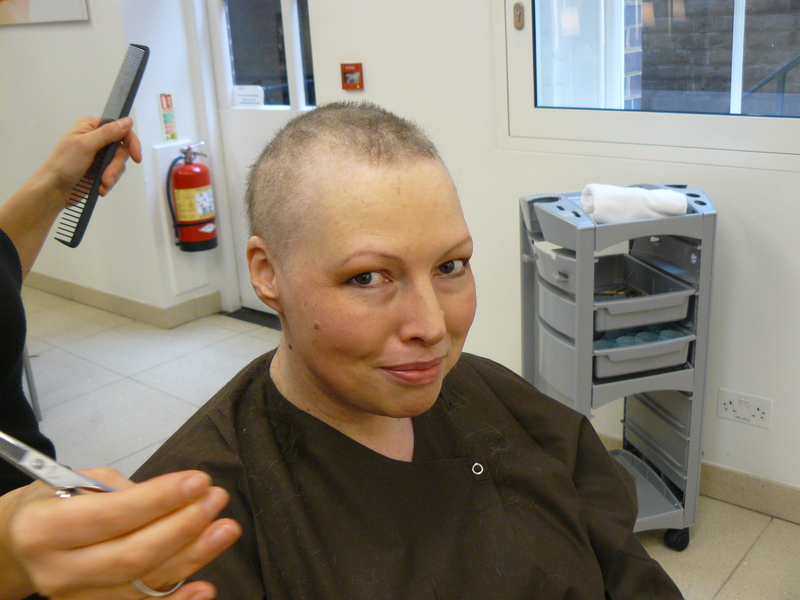 Through a fog of chemo pain and tiredness I’ve been thinking a lot about my hair. We’ve been through a lot together. I’ve realised that it’s the bad hair days that mean the world to me. And some of them were truly horrific! 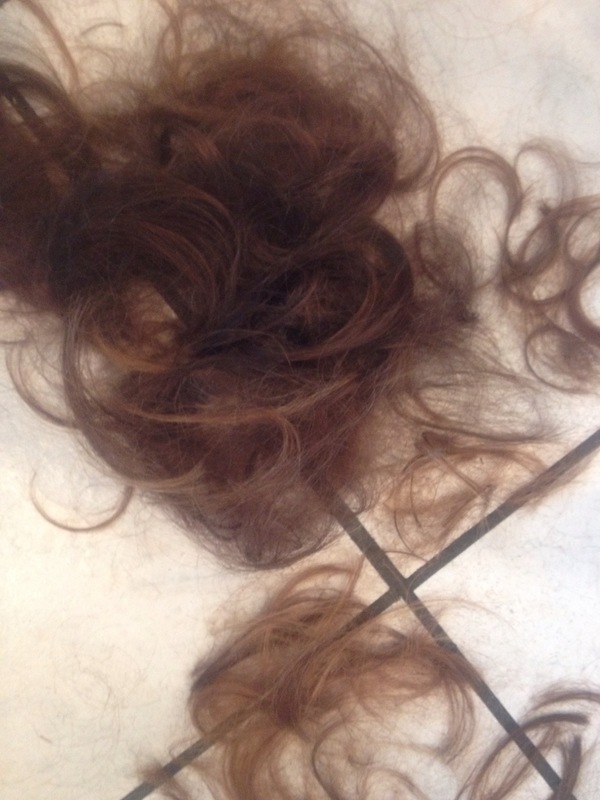 It was ten years ago that it last fell out thanks to cancer. Back then, inspired that I had a second chance at life I came up with a list of things I wanted to do once I was better. It was my list for living. One of the things was to live abroad. Not long after my treatment ended I set out on my big adventure. I was still bald, so me and my wig moved to Moscow to work at the BBC bureau. A few months and an inch of re-growth later and I ditched the wig. 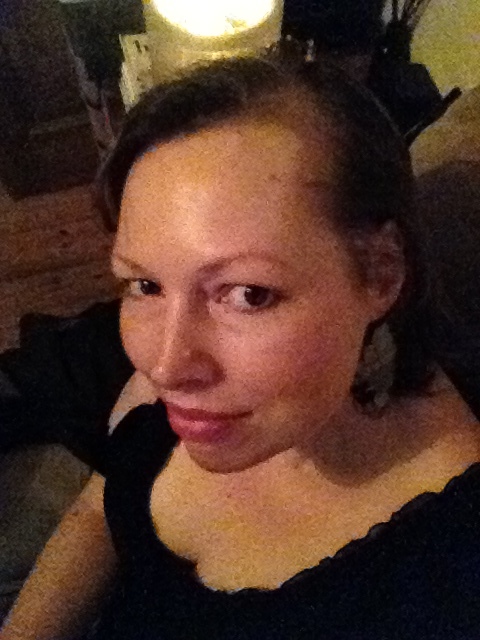 I unveiled my brand new hair at a New Year’s Eve party. The temperature that night in the Russian capital was about -30. You can see why I’m already well-practised at having a freezing cold head. Also on the list was working as a foreign correspondent. I was doing just that in Estonia when I thought that my hair was long enough for its first cut. A friend was helping me translate. Unfortunately she didn’t know how to say, please don’t make it a mullet. I was beginning to understand that bad hair dos were part of the experience although it couldn’t prepare me for my next hair don’t. A year or so later and I’d been working like crazy covering the mass protests of Ukraine’s Orange Revolution as the BBC’s Kiev correspondent when I decided as a treat to get my hair dyed for the first time since it’d fallen. I went in for subtle highlights. I left with bright orange hair. There was no time to have it corrected properly because a big story broke while I was still in the salon. I had to leave before it was even dry. A few days later and still in shock I got it toned down. It was with trepidation I got my hair cut and coloured in all sorts of places. It was never quite that awful again although I have blanked out an encounter with a hairdresser in Kosovo who had a very liberal attitude when it came to peroxide. Now I’ve had to have my long hair cut short. It’s an attempt to stop it all falling out. Apparently it was putting pressure on the follicles. I got it chopped at the hairdressers in the village. All those memories from my foreign adventure were left in a heap on the floor. I picked up some of locks and stuffed them into an old envelope. I’m not sure what I’m going to do with them but I didn’t want them all to be just swept away. I have to do everything I can to encourage it not to fall out. That means I have to avoid washing and brushing it too much. Then maybe I’ll only lose some of it. So I’ve got a short bob now. I’m getting used to another hairstyle that I didn’t want. But I’m not sad. 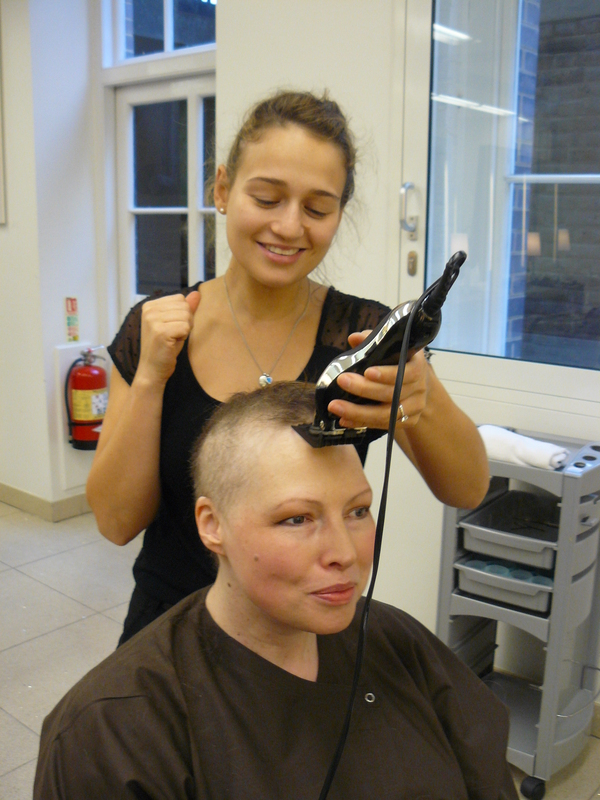 This symbolises another important stage in my life – beating cancer again.